Hearthstone went on a huge card reveal bender on Friday and Shacknews is taking this week to catch up on the newest Grand Tournament expansion cards. Today, we look at the latest cards for the Rogue and the Paladin. It's a big day for Hearthstone with this week's Tavern Brawl offering a sneak peek at the Grand Tournament expansion. Meanwhile, Shacknews is continuing to break down the expansion's final cards, analyzing them by individual class before moving forth with the final batch of neutral cards. Today, we're checking out the latest expansion cards for the Rogue and the Paladin. Before going any further, let's define an "Ambush" card. It's pretty much exactly as the rest of the card description reads. 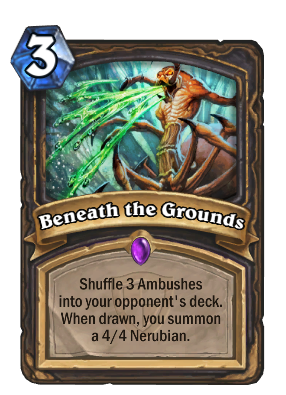 Drawing an Ambush will summon a 4/4 Nerubian for the opponent and have you draw another card. So with that settled, how useful is that for the Rogue? The answer depends on which class the Rogue is playing against. Nerubians can be a nuisance for classes like the Priest or the Paladin, which may not have an instant removal spell immediately at the ready. Other classes like the Mage and the Warlock can potentially remove these bugs without a second thought with spells like Flamestrike or Shadowflame, albeit at the cost of one of those valuable removal tools. A lowly 3 mana for a pesky Nerubian is pretty cheap, even if you don't necessarily know when you're getting it. Of course, there's always the possibility of multiplying the Nerubian numbers further with the aid of Gang Up, making them even more of an annoyance. Oh, Hearthstone. You just keep trying to make Pirate decks a thing. 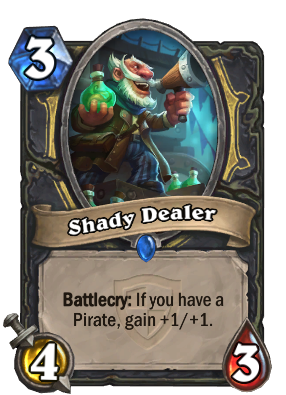 Shady Dealer is the latest card to attempt some sort of Pirate synergy. 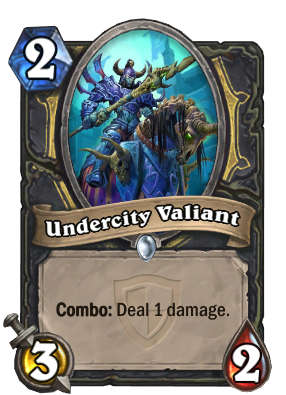 And on the plus side, his 4/3 stats for a 3 mana cost doesn't look like such a bad option. Unfortunately, the objections raised with Skycap'n Kragg remain valid. There just aren't enough useful pirate minions out there in the wild. And while this sounds like a fine supplement for a deck centered around the good Cap'n, ask yourself if it's really worth it to build a deck around a 4/6 Legendary. The Rogue has far better plays available, so a pirate's life isn't quite worth its weight in gold just yet. In many ways, this is the little brother of SI:7 Agent, albeit with something of a less useful effect. While 1 damage is nice and all, there's a reason that Ironforge Rifleman isn't a common play. In the grand scheme of things, one damage doesn't help all that much. That's especially the case when the Rogue already has a more helpful minion. Defias Ringleader has a far more useful Combo effect for just about any Rogue. And really, Oil Rogues will scoffat this guy when Goblin Auto-Barber provides the exact same stats at the same cost with a more useful effect. It's a valiant effort (no pun intended), but this new minion just doesn't hold water against his peers. Again with the pirates? Well, at least this one has a more practical effect and works far better as an opening play. See, while Southsea Deckhand relies on the Rogue having a weapon to be effective, Buccaneer works the other way. 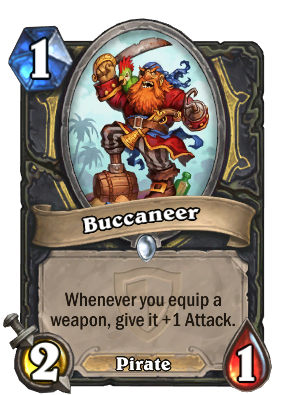 Each time the Rogue equips a weapon, Buccaneer grows more powerful. That makes this guy the perfect opening play for Oil Rogues and the like, as they can strike early while preparing to deliver the pain with those weapon spells. While Pirate decks remain something of a pipe dream, there's no reason that Buccaneer and Southsea Deckhand can't co-exist in the same deck, each using their own unique effects to the Rogue's advantage. If the Paladin can ward off zoo decks and Face Hunters long enough to play this card, this spell is liable to stop those decks right in their tracks. 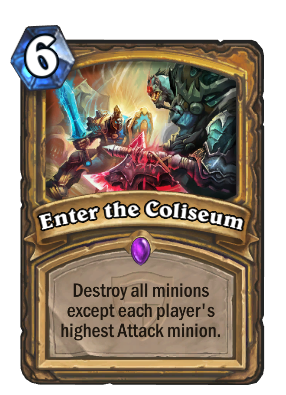 Enter the Coliseum can devastate those decks by removing all but one of their minions, leaving it to go toe-to-toe with whatever minion the Paladin has at the ready. This sounds like a good idea on the surface, but it's a very situational play. There's no guaranteeing that the opponent will necessarily have low-attack minions on the board and if Paladin players don't have a high-attack minion of their own, this play doesn't really work out. Not to mention that if you're matched up against a Handlock player, forget it. This spell will do little good if it still leaves a giant standing on the other side. For 6-mana, the ideal option remains Equality and Consecration. There are some interesting synergy possibilities with Enter the Coliseum (such as having Kel'Thuzad out to resurrect your own minions), but they're too situational to really be worthwhile. Well, here's a guy that could very annoying. At 6/6, Mysterious Challenger is a thread on his own. Now pair him up with that Battlecry effect and that's a recipe for trouble. To truly gauge Mysterious Challenger's effective, let's look at the Paladin's Secrets: Avenge (Yes! ), Eye for an Eye (Yes! ), Noble Sacrifice (Yes! ), Redemption (So much Yes! ), Repentance (Also, Yes! ), and Competitive Spirit (We'll cover that one in just a second). Noble Sacrifice remains one of the most underrated Paladin plays, as it essentially grants minions protection against one hit from other minions. That's a handy spell to put out there. Avenge can be a fantastic play, as it can strongly buff up even the lowliest of minions. But the cruelest play just might be Redemption. With 6/6 stats, the first instinct will be to try and remove Mysterious Challenger immediately, but if his effect lays down Redemption, an opponent taking out will simply bring it right back. Follow that up with Blessing of Might/Blessed Champion on the next turn and go right for the face. 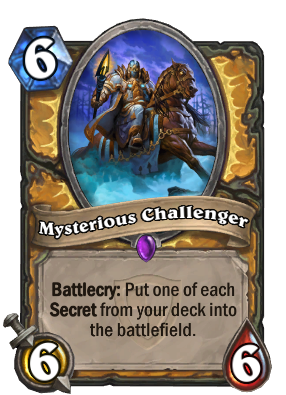 Depending on how he's used, Mysterious Challenger has a good chance to become a new Paladin favorite... assuming, of course, that your Secrets are still in your deck and not in your hand. The Paladin has a brand new Secret and... to be honest, it looks to be kind of a dud. A lot has to happen for Competitive Spirit to be of any use. First off, the Paladin's minions needs to survive until the next turn. That's certainly doable. But what's the payoff? A +1/+1 bonus that may not make much of a difference. That doesn't sound like much of a prize, even if it is comparable to similar spells like Power of the Wild. Just make sure you actually have more than one minion to benefit from this one. 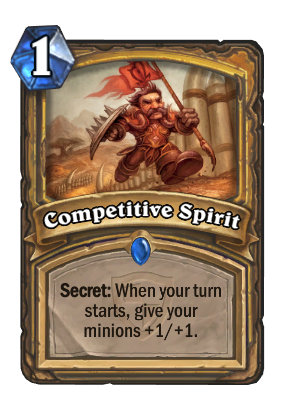 There is one good use for Competitive Spirit, though. Muster for Battle and Quartermaster should help ensure there are more than enough minions to take advantage of this effect. It may also be a nice way to help minions recover from an Equality/Consecration combo. Other than that, this is not one of the Paladin's better secrets. There aren't a lot of Murloc Paladins out there, but Murloc Knight certainly makes the case for such a deck to exist. The Inspire effect will keep the Murlocs coming if this guy isn't dealt with swiftly. On top of that, his effect means Silver Hand Recruits will keep coming down the assembly line, too, setting the table for a Quartermaster play. 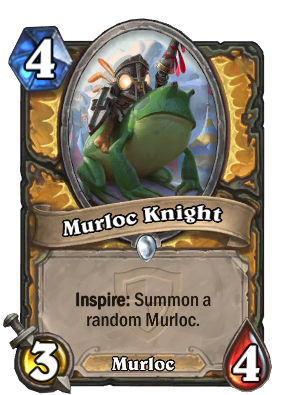 There isn't much more to say about Murloc Knight, except that while its effect relies on random chance, there aren't as many murlocs as one might think. There means plenty of useful Murlocs could come out, whether it's Murloc Warleader or Bluegill Warrior. If he's still standing on Turn 5, play your Hero Power and Coldlight Seer to really make some trouble for the opponent. This is a spell that will have Paladins asking themselves, "Just how much room do I have in my deck?" The reason that question comes up is because this effect can pretty much be issued to a minion by playing both Blessing of Might and Hand of Protection, a combination that only comes at a cost of two mana. But that's two precious card slots. How bad do you want the convenience? Don't let this card fool you, though. There are ways to get this kind of effectiveness without wasting a slot on this spell. The primary method is using Blessing of Might and then playing Argent Protector to give that minion Divine Shield. Or even spend some extra mana and roll the dice with Coghammer. 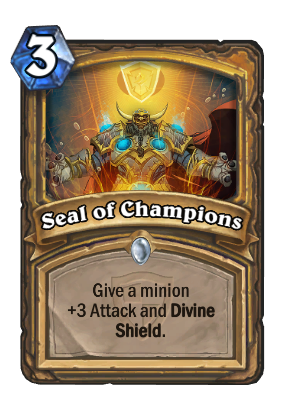 Seal of Champions isn't a bad spell, but there are certainly better ones at the Paladin's disposal. There's still a lot of catching up to do when it comes to the Grand Tournament expansion. Shacknews will continue its ongoing analysis of these new cards all this week. Come back tomorrow when we take a look at the newest cards for the Warlock, Shaman, and Warrior.